Note :- We exports our products all over world likes North America, South America, East Europe, South East Asia, Oceania, Middle East, East Asia, Western Europe, Central America, Northern Europe, Southern Europe etc . The Striped Shaggy Rugs are fade proof and made of anti-skid material that provide maximum safty. We are a unique entity in this industry, actively committed towards offering a premium quality range of Cotton Striped Pitloom Rug. Price Range:- Rs 35 to 75 Per Square Feet. 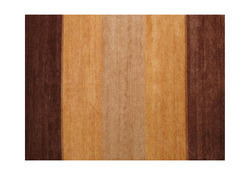 Owing to the wide experience in this domain, we are instrumental in offering Striped Chindi Rug to our clients. 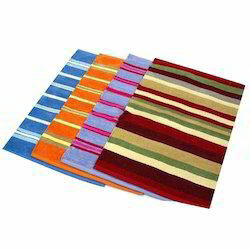 With immense market knowledge, we have been able to provide optimum quality Cotton Striped Rug. These rugs are woven using a polypropylene and jute mix. This all-weather area rug collection features a durable structured woven construction which allows it to be suitable for indoor and outdoor use.